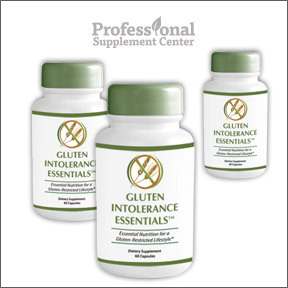 Professional Supplement Center is pleased to announce the addition of Gluten Intolerance Essentials™ to our extensive line of high quality supplements, nutraceuticals, medical foods and other health and wellness products. Gluten Intolerance Essentials™, the flagship product of Emerging Nutraceuticals, was specifically designed for those who must have or choose to have a gluten restricted lifestyle, including those with celiac disease, gluten intolerance or gluten sensitivity. Gluten Intolerance Essentials™ is a science based, superior quality formula that provides the essential vitamins, minerals and amino acids that are necessary for optimal health and are commonly deficient in those who follow a gluten free or gluten restricted diet. The inclusion of digestive enzymes, such as peptidase DDP-IV, allows for the complete breakdown of allergenic gluten proteins in the event of accidental gluten ingestion. Pre and probiotics further support immune function, help to relieve irritable and inflammatory bowel symptoms and aid in the maintenance of good digestive health. Following a gluten free diet often results in nutritional deficiencies, which can lead to malnutrition. Gluten Intolerance Essentials™ is designed to complement and augment a gluten free diet. Designed by medical researchers, practitioners, specialists and naturopathic physicians, this leading edge supplement is formulated to address the medical and nutritional issues of those with gluten sensitivities and may improve the quality of life for those on gluten free diets by alleviating fatigue, improving concentration, healing the bowel and reducing intestinal issues. Addressing nutritional deficiencies may help over time to reduce the risk of developing disorders associated with celiac disease and gluten intolerance including anemia, osteoporosis, depression, menstrual disorders, thyroid disease and arthritis. Gluten Intolerance Essentials™ by Emerging Nutraceuticals is specifically formulated for nutrient absorption and replacement, prebiotic and probiotic support, digestive healing and enzyme support, bone health support, advanced immune support, energy enhancement and antioxidant support. Manufacturing in the U.S.A under stringent quality control procedures, utilizing highly absorbable, bioavailable, hypoallergenic, pharmaceutical grade Non-GMO ingredients ensures purity, potency, efficacy and optimal results. This entry was posted in Home and tagged Emerging Nutraceuticals, Gluten Intolerance Essentials. Bookmark the permalink.